KATOWICE, Poland – Described as a “Palace of Youth” when it was originally built in 1951, Katowice Palac Mlodziezky was set up to create favorable conditions for youth culture and sporting activities in Poland. A public institution (listed on the Register of Historical Monuments), and administered by the Silesian school board at Katowice, it has recently invested in a new HARMAN Professional sound system, masterminded by territorial distributor ESS Audio after the previous system reached end of life. ESS Audio mounted its successful bid as part of a consortium, along with Przedsiębiorstwo Specjalistyczne Teatr, who was responsible for the stage lighting and mechanical installation. The audio element of the project was realized by independent consultants/integrators, Telos Wojciech Zieliński. The new audio concept for the 450-seat multipurpose auditorium was designed to create greater flexibility, allowing it to present concerts, theatres and films. In order to achieve this, premium components from the HARMAN Professional catalogue were specified. While the main sound system is based around a JBL VERTEC® system, the optional cinema surround system can be switched in as required and the loudspeakers behind the screen are mounted on trolleys. Hangs of eight JBL VERTEC VT4887ADP elements per side form the main PA, underpinned by three VT4881ADP subwoofers on each side. This is bolstered by three further VERTEC VT4887 loudspeakers as front fills, while for stage monitoring ESS Audio specified eight VP7212MDP enclosures. The entire front of house system is controlled and optimized via dbx DriveRack 4820 processors. 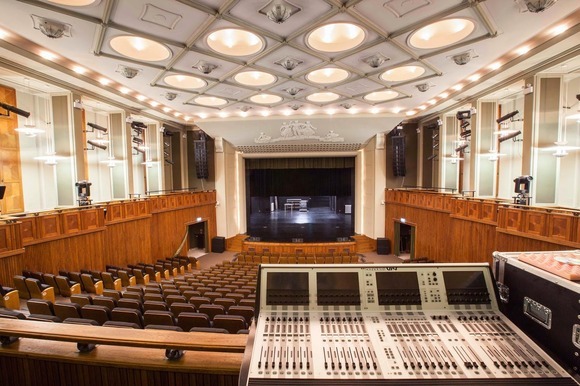 In order to carry out mixing duties at front of house, ESS Audio specified a Soundcraft Vi4 console, with a Soundcraft Vi1 in monitor world—the engineers in both locations are provided with JBL LSR2328P for their own reference monitoring. When the operating mode switches to cinema, the appropriate presets kick in and the mobile system, comprising three elements of JBL ScreenArray 4732, boosted by a pair of JBL4642C subs, takes over. Creating the surround sound are JBL’s 8340A, powered by Crown DSi amps. ESS Audio has also upgraded the venue’s microphones, with an AKG DMS700 digital wireless system at the heart. ESS also supplied AKG C451B and C414B XLII, as well as AKG K271 headphones. The overall renovation project was prepared by the Biuro Architekt Kaczmarczyk architectural studio from Sucha Beskidzka, Poland, and the entire project cost PLN 42,2 million (€10 million).